There are many apps available for your iDevice which allow you to manipulate portraits of people for comedic effect. There’s FatBooth, AgingBooth, Pocket VFX and FACEinHOLE (!) to name but a few. In my opinion, the best of the bunch is ZombieBooth: 3D Zombifier (itunes link) from Motion Portrait Inc., a Japanese developer with many other tasty apps on their roster. On launching the app, you can take a photo or open an existing photo from your photo library. You can also choose to look at one of the ‘zombies’ you have already created. Once you have chosen or taken a photo, you can move and scale the shot as you please, then you hit the ‘choose’ button to create your zombie. I have to say I was quite surprised at how realistic it looked. 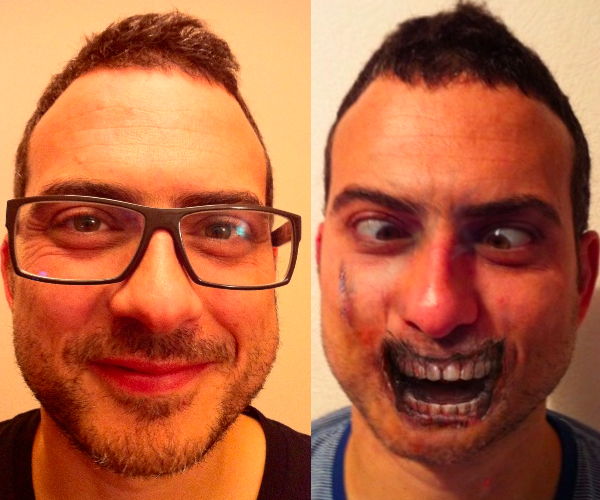 The app creates a really impressive 3D zombie face from a 2D image and boy are they horrible! This is obviously a good thing. The zombie will follow your finger as you drag it around the screen, moaning and growling, and occasionally trying to savage you if you get too close to its mouth. If you’d like to change the appearance of your zombie, just shake your device and the app will present a different look for you. You can then export a photo to your photo library, email client, Twitter or Facebook. What’s really cool though is that you can record the zombie’s movements as it tracks your finger and email it as a movie, or upload it to Youtube or Facebook. All your zombies are also saved to a library within the app. It’s revolting fun. I certainly wouldn’t show my three year old daughter that’s for sure. Some of the people I have shown these zombies to have looked away in disgust. Excellent! There are however a couple of points to be aware of. Firstly, the app doesn’t do such a good job if your subject has a lot of long hair. Perhaps get them to tie it back whilst assuring them it’ll be worth it. Secondly, try to take your portraits in a well lit area against a plain background. This helps the app recognize the face and also looks better once your photo has been converted to 3D. Lastly – and this is a minor niggle – the sound gets repetitive very quickly. But hey – what do you expect for $0.99?